I wish that I had a picture of my first reloading bench. I will try to describe it briefly but cant possibly do it justice. The bench was small in size maybe 4 feet wide. I had all of my reloading essentials not even some of the things that most would consider essential in a plastic bin with a lid. In the bin, my supplies consisted of a few boxes of bullets, 2 or 3 pounds of powder, a wilson case trimmer, 1 reloading manual, dial calipers, a powder trickler, a .17 cal funnel, an RCBS scale, a Wilson chamfering tool, and a RCBS primer pocket wire brush gizmo. Behind the bench was a single target taped to the concrete block exterior wall. This target was a trophy to me at the time, but I couldnt even tell you where it is at this point. The Rockchucker press was mounted to the bench, and a Lee Perfect Powder Measure was mounted to a board for powder dispensing. When I first began reloading, I didn't even have the powder measure and I had to literally trickle the entire charge. I have a few small children and have to prioritize and limit my spending on reloading stuff. I was able to load quality ammunition even at my rather confined space with the limited equipment that I had. I am now very proud of my reloading area, which is a part of the utility room in my house. 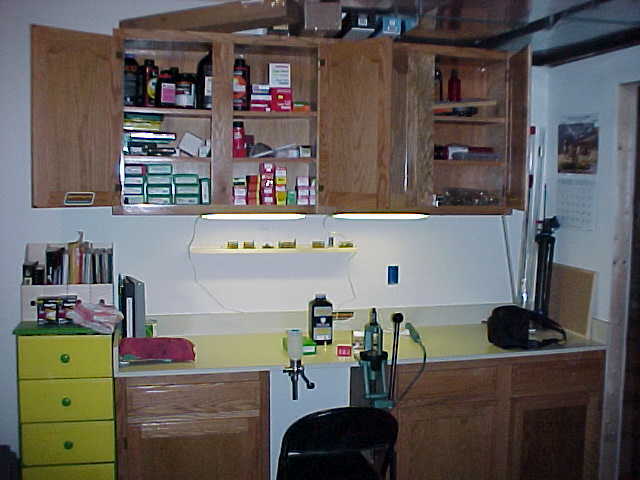 Below is a picture of my current area which includes overhead and base cabinets. When I was putting this area together, I felt that I would have plenty of cabinet space. I am finding that it all fills up with stuff that I couldnt be with out. I have seen a few pictures of reloading rooms that I can only aspire to call mine, but I am more than satisfied with my little area for now. I also have my Liberty gun safe in this room, which cant be seen from the picture. 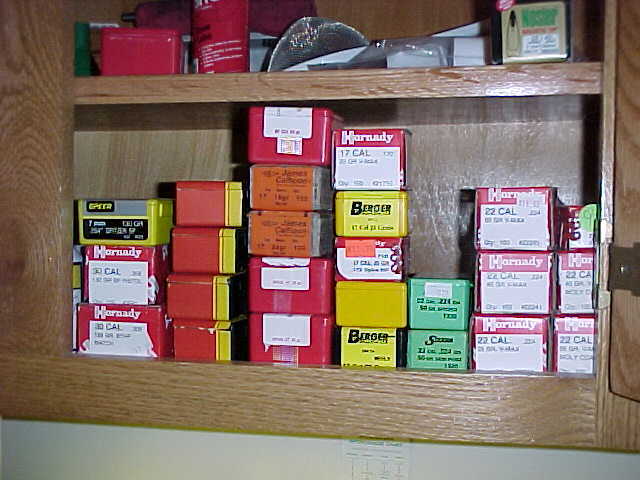 In order to conserve room in my cabinets, I store most of my loaded ammo in the safe. I spend a fair amount of time at my bench reloading, but most my case preparation is done away from the bench. I have to find time whenever I can, and this usually means while the kids are watching TV, taking a bath, eating, or sleeping. I find that case preparation takes up most of my time anyhow, and most of the tools used for case prep are portable hand-held tools. I now have more reloading tools than I care to list, a powder selection that covers almost anything that you can want to load for, and a lot of brass. My bullet selection is pretty good, but mostly consists of .17 caliber bullets. Actually, I have over 1500 .17 caliber bullets at this time. Below is a picture of my bullet selection. You may notice that I am a big fan of Redding dies. There are several reasons for this, but the primary one is that they are a small company that cares about the end user of their product. I have never had a problem with any of their products, and I like the fit and finish of their dies. 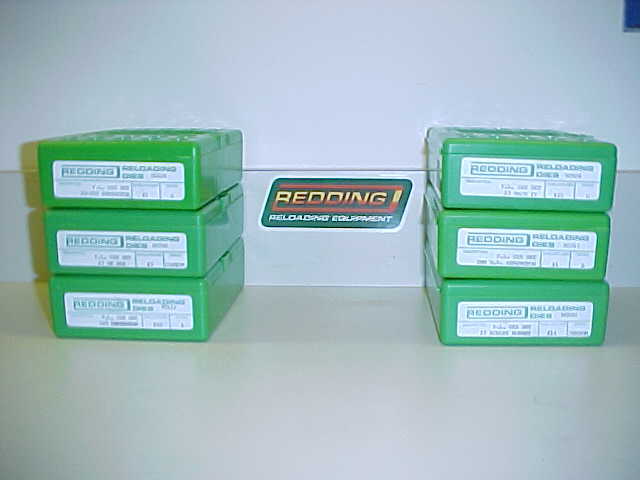 I order Redding dies when at all possible and prefer them over all others. I may get an arbor press at some point, and with it I will use Wilson hand dies. I use a Wilson Case trimmer on a Sinclair stand for my case trimming duties. Wilson is another top notch company to deal with. A few weeks ago I called them to order a case holder for a wildcat case that was not offered. They explained that they could make the case holder from the reamer specs or from an actual case. The turn around time of the order was a week, and the cost was downright cheap. The Wilson case is more than sufficient for anything that I do. I owe a thanks to Todd Kindler for talking me into it along with my most recent purchase of the Harrells powder measure described below. I have recently started using a Harrells BR model powder measure and am very happy with its performance. I had been using a Lee Perfect Powder Measure which was the cheapest that I could find at the time. The Lee has been a good measure that was well worth the 20 bucks that it cost, but I weighed every charge that I threw. I now use the Harrells and dont weigh my charges. I have been able to throw charges very consistently and am able to record the setting for future reference. I can then set the measure to throw that same amount when I am loading for that round again. The clicks are distinct and it is very easy to repeat a setting. When I am starting to load, I throw a series of charges weighing each charge until I feel confident that I am throwing a consistent charge. I have heard lots of folks question if it is possible to throw a consistent charge and they insist on weighing every charge. The bottom line is that you have to use the method that you feel most comfortable with. I have shot a lot of loads over my chronograph since I started using the Harrells and feel very confident with it. Many benchrest shooters dont weigh individual charges, and records continue to be set. I have adopted the method of tapping the handle against the stop twice at the top of the stroke and then twice at the bottom. The action of the measure is very smooth. I usually load the small capacity cases, and have found this measure to be consistent at charges as low as 11.0 grains. I havent attempted to throw any charges less than that, as the .17 hornet is the smallest case that I currently load. I currently load for the following cartridges. You will probably see a trend, but we all have our weaknesses.